The MoreSpace Umbrella Stand comes with everything that you need to securely put your umbrella on your outdoor area. All you supply is an umbrella and a common drill. 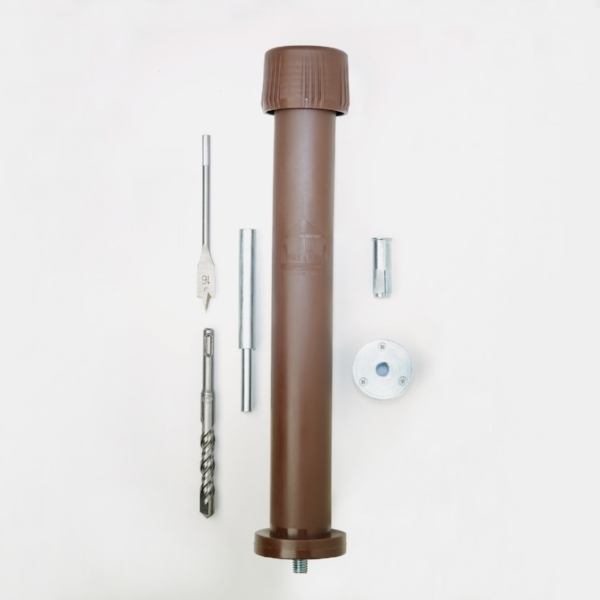 MoreSpace umbrella stand packages come with all the equipment you need to install in concrete or wood, or your can buy the MoreSpace spike version for grass/sand. We also offer additional mounts that you can buy separately. Click on the appropriate image below to buy online through our secure server. The MoreSpace Umbrella Stand package. Comes with everything you need to install in wood or concrete. All you supply is a standard drill. If you are mounting in grass or sand, buy one of these base units and then buy the spike (MS-S) separately. The MoreSpace Spike for grass and sand installations. Note that this item is for the spike only. You must also buy one of the MoreSpace base units to connect it with. If you want to have more than one mounting spot for your MoreSpace Stand, buy this package of additional wood and concrete mounting hardware. This kit contains only the mounting hardware. You need a MoreSpace base unit to insert into this mounting spot. We are now accepting applications for distributorship. MoreSpace Umbrella Stand packages come in an easy-to-use retail display, perfect for counters or end-caps.